Major General Sir George Wade Guy Green KCB was born in the Tytherington Vicarage (now the Manor House) on 25th April 1825 to Rev George Wade Green and Mary Anne Green (nee Key). He had five brothers and seven sisters. He married Ellen Facey Carter daughter of William Carter of Troy, Jamaica on 16th June 1859 and they had seven children. He had a very distinguished military career at the height of the British Empire, serving in the Bengal Army in India, as did one of his brothers. 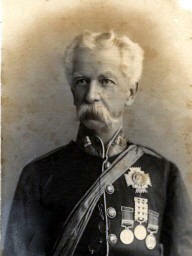 Sir George retired from the Indian Army in July 1879 and died on 27th November 1891 age 66 whilst living at Bedford Lodge, Cheltenham.